Sammy Callari is just one of many who will be volunteering to help bring SWFL’s “Night to Shine” alive this February. However, this isn’t his first rodeo. Sammy has volunteered for this event before and has a strong passion for the impact it has on the disabled community. Sammy is a former MMA fighter who became a personal trainer. It was there he met Parker, a 13-year-old boy with Down syndrome who became his client, then his friend. “Our personalities just clicked from day one,” Sammy said. The pair’s near-instant chemistry quickly evolved into a brotherly bond. As an underdog himself, the young trainer connected with his client’s challenge of having to fight for acceptance. Sammy taught Parker how to make strides in his physical health but to Sammy, those lessons paled in comparison to the lessons Parker imparted upon him. “My volunteering work came after my relationship with Parker,” Sammy explained. “I felt overjoyed and extremely happy my first session with him. I will never forget it. We didn’t do anything out of the ordinary but I left the gym feeling very happy. I wondered, ‘What did this thirteen-year-old do to me to make me feel so full of life?’ And a lot of it comes down to Parker and the individual he is.” Thus, participating in an event like Night to Shine was a no-brainer. Like Parker, Sammy wants the world to understand and appreciate the disabled community as a part of their community. What is a Night to Shine? Night to Shine is an event created by the Tim Tebow Foundation but quickly found momentum across the globe. It’s both an all-expenses-paid prom for members of the disabled community and a free night out for their family and caretakers. The event takes place on February 8 this year from 6 pm to 9 pm EST. Currently, there are 3 locations in the area hosting the event: one in Naples, one in Sanibel Island, and one in Cape Coral. The event has grown every single year, swelling from one location to three. Already, registration is full as all 3 locations expect a packed house ready for an unforgettable experience. 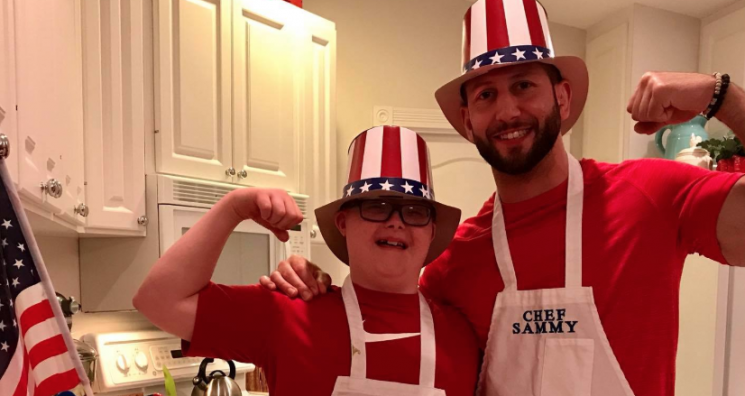 Sammy is volunteering again this year to help make Night to Shine a success. The impact of previous events made him want to be a part of it yet again. “It was unbelievable,” he said. “It’s one of those things you just have to be there to experience. We’re all looking forward to it this year.” Night to Shine focuses on putting their disabled guests in the spotlight for a night. Every single individual will walk down the red carpet and is crowned king or queen of the prom in acknowledgment of their significance. They are part of our community with differences worthy of celebration. Yet the guests aren’t the only ones who feel rewarded at this event. Volunteers give their time but take home with them the priceless gift of reminding these special members of their community they’re loved. “I think giving back is one of the greatest feelings when you do it with the right intentions,” Sammy said. “I don’t do it for the money; I don’t do it for the notoriety; I don’t do it for the publicity. I just do it knowing inside of me that it’s the right thing to do.” “My calling for helping people with disabilities is because a lot of society puts people with disabilities in a corner and say, ‘No, you can’t do this; you can’t do that,’ and that upsets me inside. I believe everyone has abilities inside of them and things they can do and that’s what we should be focused on.” For more information on this year’s Night to Shine, visit https://www.swflnighttoshine.com/.